There is no time to investigate it. And no time to reupload README. But I still can write a little warning here. On one of my windows PCs there is a terrible lag for keypresses. It is impossible to play my game. If you experiencing random lags between keypress and boat movement please do not suffer! Try to use other OS or other computer. I have some features to do. But game looks good enough. I will be glad if someone try it before the deadline. Now it is time to rest for a while and to try other games. In the morning I think that everything I do is complete mess. But I played a lot with that today. And now I think that it is a masterpiece! I tried to launch my game on Windows. Got a couple of bugs. As usual. There is no gluBuild3DMipmaps. Need to write my own. I forgot to add normals to terrain. Without mipmaps I can see it clearly. Game crashes when windows resized (I think it loses textures and buffers). Pygame can't find the default font when game packed with pyinstaller. I will add a custom font. My game becames fun. I played a lot and draw more levels. But I got a strange bug. My currents are working on one computer but gone crazy on another. May be it is better to turn it off completely. My boat physic looks like a bad car physics. I'm tired to rewrite it. Time to prepare packages. And add a boring but important stuff like a plot. Yesterday was disappointing. I failed to invent the flow of water. My FPS is too low on some of my computers. Today I remembered some important things. 1. I am a competent software developer! Writing computer programs is an important part of my life. I can do these things right. 2. To make one new thing you usually need to make a hundred broken things. What I want to do today. delete code I don't like. add some fun things to game. Funny sounds when hitting coast and reaching checkpoint. I remember one "important anecdote". There is a very important anecdote about an author who thought that he would write all the most exciting and interesting parts of their story first, and go back and put in the boring middle parts afterward. When they were done writing only the exciting parts, they looked over their work, came to an important realization, and sent the completed draft off to their editor. So I stopped to make a big boring world and started to make races. I have no boat physics yet. So making a lot of races now is reckless. I prepared some fetch quests and played with terrain generation. I wasted a lot of time to make terrain generator and now game looks terrible. There is two obvious things I can do next. Physics. And gameplay. Gameplay is more important. Now it is time to think about implementing port interface, quests and races. I have a poor ui code. I think I should use it to make a interfaces for quests, cargo and timers. I enjoyed using the Tiled (https://www.mapeditor.org/) last pyweek. Why not use it again? But quests are more important now. I count Monday as the Day 1. Now is 15:06 UTC+3. Searched for a good boat models. 3D model sites listed in http://www.pygame.org/wiki/resources are worthless. Registration required and licenses are not clear. Found a good model with a good license on https://opengameart.org. I am using https://www.pygame.org/wiki/OBJFileLoader as a library to load the file. Watched some YouTube videos about flow. Liked one about divirgence and curl. 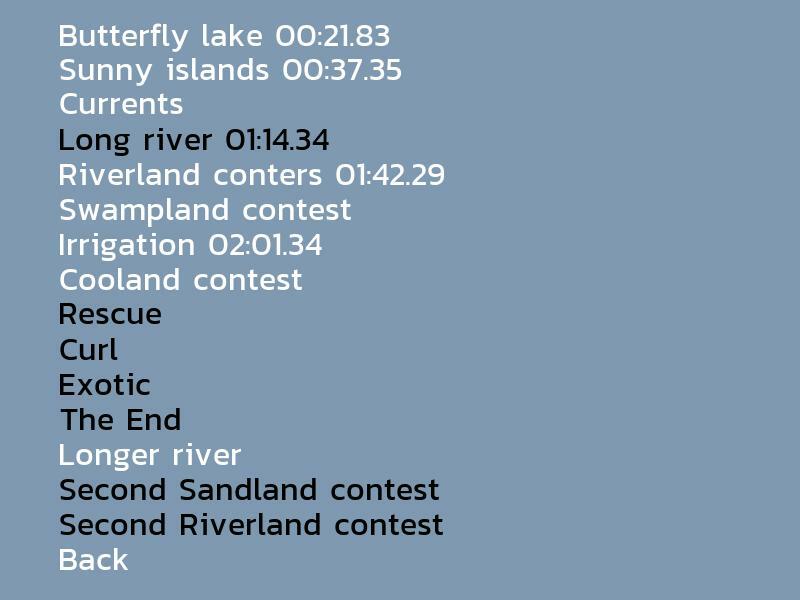 Now I want to make a boat racing game. Spent some time looking for a good ui library for Python and OpenGL. Everything I found looks unreliable or not convinient. I will make my own ugly ui. Main menu is ready. The theme is flow and I have no plan for it. I don't even know exact meaning of this word. I looked it in wikipedia and urban dictionary. I think psychology and musical meanings are irrelevant. There is fluid flow, air flow, traffic flow, money flow and mathematical meaning of the flow. I going to use Ubuntu 18.04, pycharm, pyglet (or pygame) and pyinstaller. I already found some good new music in http://freemusicarchive.org/. Today I can make right now main menu and music playback.